Are you looking for a fun outdoor activity with your family or close friends? I bet you do. Then you need to take your adventures with your significant other to the water. By doing so, you’ll improve your happiness as well as your fitness levels. That’s why you need to try out kayaking. And to do so, you need the best tandem kayak available on the market today. Let’s get you started with, what’s a tandem kayak? It’s a small-like boat ideally meant for one person, but many other models can comfortably accommodate two people. These boats are quiet enough and powered by a less noisy motor for maximum relaxation on the water bodies. You can get a buy-and-paddle one which makes it easy to use and maintain. It can be tricky and tiresome to find the tandem kayak that suits all your preferences. Why is that? There are so many different types of models out there that come with varying features. Worry not! In this review, we have done enough research to bring you the tandem kayak of your choice near you to satisfy all your paddling needs. If you’re a beginner and have not tried out kayaking, then you’re missing a lot on this significant outdoor activity. Here are our top 8 tandem kayaks. Check them out! 2 Reasons I Should Paddle with A Partner? 3 How to Choose the Best Tandem Kayak? If you’re looking for a tandem kayak that can accommodate a child or pet, then the Ocean Kayak Malibu 2 is what you need. It comes with a two-plus-one-feature that carries a third person as long as you maintain its maximum weight stability of 425 pounds. Are you a couple with a child who wants to go for a boat riding? If so, then the Malibu 2 is what you need to have as your tandem kayak. The Malibu 2 has three seating positions that are well molded in and has patented footwells. When it comes to convenience and comfort, this model is not left out and gives the maximum satisfaction for anyone looking for the ideal tandem kayak. For added comfort, it has footwells that overlap each other and thus can accommodate any leg’s length. You don’t need to worry about buying a kayak that won’t fit your legs perfectly. It also comes with gear straps, molded-in handles as well as a hull and deck design. The design itself makes it possible to stack as many hulls you may want for convenient and easy on dock storage. The Malibu 2 is everyone’s go-to-kayak, and it has advanced features to hold at least two people. You can use it for fishing while still relaxing as you enjoy some cool breeze from the water bodies. It has a streamlined body design that makes any maneuver easy and safe at the same time. It has sufficient space for all your fishing gear, rods, as well as the fishing crate. But for a two-person ride then you can do away with the fishing gear for maximum comfort and safety. If you want to ride in fast and rough water bodies, then you need this kayak since it can be easily controlled. The Malibu 2 has every detail that you may require in a tandem kayak. It can hold up to 3 people. For increased comfort, it has overlapping foot wells. It has large adjustable seat rests. Some users claim that it’s slightly heftier than other double kayaks. A new model from the Brooklyn Kayak Company (BKC) that incorporates the latest and modern technology features in a tandem kayak. You’ll cough up some more money as compared other models in our review. 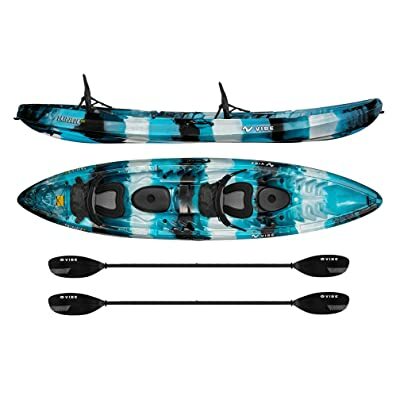 As long as you’re ready to hit the water with your significant other and have the modern kayak with you, then you must have the TK219 tandem kayak. It’s also a 3-person kayak that can comfortably hold a maximum weight of 440 pounds. It’s a bit lightweight since it weighs about 70 pounds. The TK219 is spacious enough to hold all your fishing gear because it has two adjustable holders and 4-flush mounted rod holders. Do you want to go fishing? If so, then now you know which kayak to use with your partner in crime. It has a back paddler and a large gear vestibule for plenty of deck lashing. What are you waiting for? The TK219 is the safest as well as the most stylish tandem kayak that you can get on the market today. 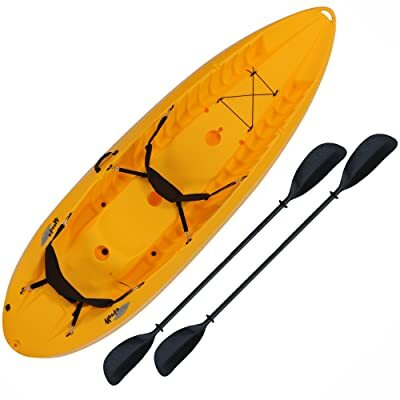 The features make it top rated on Amazon and a must-have boat for all your kayaking adventures. For maximum comfort, each paddler comes with a built-in footrest thus providing adequate leg room no matter your leg’s length. Also, it has two kayak seats made from deluxe material and very lightweight aluminum paddle for ultimate paddling experience. The TK219 is wide enough for a stable ride, and you can move your legs over the side as you paddle. It can accommodate three people. It comes with comfortable deluxe seats. It has one deck lashing. It provides a smooth sailing experience. It has ample space for all your fishing gear. It does not provide the third person seat. Do you want an inexpensive kayak? Then look no further. 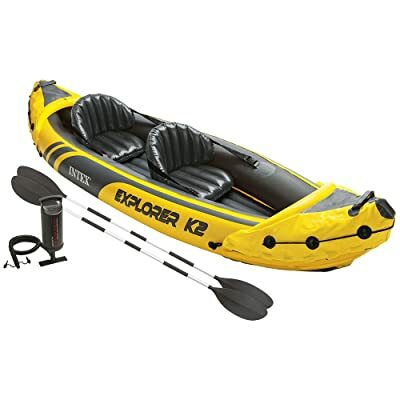 We have the Explorer K2 that costs less than $100. It’s a model that suits all your budget needs, and that does not at all limit its features. It’s a two-person inflatable kayak that can hold weights up to 300 pounds. The Explorer K2 is very light and weighs about 41 pounds. The feature that is more recognized is the fact that it has a wide beam that offers maximum tracking ability as well as stability. The Explorer K2 has a high back seat that comes with lumbar support to improve your comfort as you paddle. Even though it’s cheap, this model does not sacrifice its overall quality. The rid frame is made from a patented material that is multi-layer to make it withstand any test of time. This makes it the best kayak for people who spend a lot of time on the water either for fishing or just relaxing. For extra durability, it has multiple air-chambers and abrasion pads. Thus the Explorer K2 always stays sturdy even when the chambers are punctured. It’s very spacious and provides a lot of storage options. The options include two paddle holders and rod holders. You can customize the kayak since it has a removable mounting rail. You can also customize with fly tying vise, rod holders, fish finder and other accessories. With the Explorer K2, you have a great kayak with extra features that offer maximum safety and comfort without sacrificing your paddling experience. It offers superior tracking as well as stability. It includes paddles and an air pump. It comes with a two–year warranty. Not ideally meant for rough waters. It removes a lousy odor when stored wet. The Bali 13.5 is designed for a family outing with capabilities of holding 1 to 3 persons. It comes with three comfortable seats that can carry two adults and one small child. It’s the best kayak for a young couple who wants to enjoy the calm waters with their young one. It’s a sturdy kayak that will not tip over in any water current. And that is because of its length of 13.5 inches and weight of about 70 pounds. If you want a boat for solo kayaking, then the Bali 13.5 is not what you need. It’s a bit heavy, and you won’t be able to carry it on your own. It has fabric handles that make it challenging to carry, and that’s why you need an extra person. The Sun Dolphin Bali is becoming recognized by many kayakers, and it’s because of its storage capabilities and adequate space available. Apart from holding two adults and one child, you can go paddling with all your fishing gears and other essentials. Why is that? It has three storage compartments. For some flexibility as you paddle, the Bali 13.5 comes with adjustable footrests and at the center is where you’ll find an additional seat for a third person. Here is where your young one can fit well since it’s a bit small and molded with plastic. The fact that the child seat is centered offers some options for family use as well as additional flexibility. It comes with two paddle holders, and it’s precisely made to last for long because it’s made from a material that is impact-resistance and high-density. And this makes it the best tandem kayak for beginners. It has enough storage from its three compartments. It can comfortably hold two adults and one small child. It comes with deluxe adjustable seats for maximum comfort. It’s made from top-quality materials, and hence it lasts for long. It’s a bit heavier and thus not ideally meant for a single person. If you want to go kayaking on your own, then you need the Lifetime 10 Foot Manta. It can even hold up to 3 persons but offers versatile options that do not sacrifice its safety or comfortability. Its lightweight with a weight of 60 pounds and can comfortably carry 500 pounds. It comes with two paddles as well as two backrests for maximum comfort. It has a design that is tunnel-hull like for guaranteed maneuverability and stability. And this explains why the Lifetime Manta does not tip over easily. The Manta is a convertible tandem kayak that apart from holding three people, it has a large cargo area where you can put all your food as well as fishing gears. The seats are also high and dry, which means that it allows its users to ride comfortably while staying off the floor of the boat. What makes this kayak to stand out among its competitors is the fact that it’s very durable. The polyethylene plastic material that makes this boat is very durable, and the company offers a 5-year warranty. Thus it’s the best tandem kayak for sailing, fishing, and surfing. The Lifetime Manta comes with innovative built-in features that make it ideal for solo kayaking. 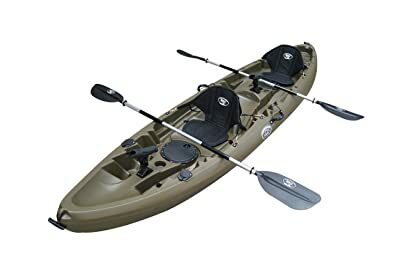 It has a paddle cradle, large cargo area, fishing rod holder, mast receiver receptacle, side carry handle, shock cord straps, and a bottle holder. It’s a budget-friendly kayak that offers much more than other high-end priced models. For maximum comfort, while paddling, the Manta has overlapping foot wells. Note that it does not come with paddles and you’ll have to buy your own. You can even upgrade it by installing electric trolling motor known as lifetime power mate. It’s best for solo kayaking but can even hold up to 3 people. It’s easy and convenient to use. It has overlapping foot wells that offer paddling leverage. It provides a stable design that makes it difficult to tip over while on water. It does not include paddles, and you need to buy your own. It has a weak tracking, and it’s very slow on water. When we talk about inflatable kayaks, the Sea Eagle SE370K comes into our minds. It’s proud of its NMMA certification and lightweight. Another thing to note is that it will take you about 8 minutes or so to fully inflate it. 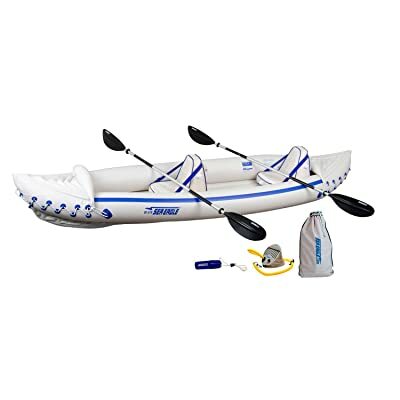 Thus the fact its inflatable does not mean you have to use a lot of time to have it fully functional and ready to go kayaking. It’s a boat like no other that offers you the option of either sitting back and relaxing as you cruise on calm waters or race down the turbulent waters. Thus the SE370K is what you need for all your overall kayaking needs that is suitable for advanced users or beginners. If you want to go solo, then you should consider owning this kayak. Why is that? Its ideally meant for three people but due to its lightweight of 32 pounds, makes it the best for a single person kayaking. It has more advantages in its holding capacity more than other models on our reviews. It can comfortably hold a weight of about 650 pounds. The space in this inflatable kayak is overwhelming, and you can even bring along your dog. And if you’re worried about dog scratches, the SE370K is built to withstand the scratches since it has a PolyKrylar hull feature. You can also carry fishing and camping gear, food, and other small essentials since it has an ample storage space. What makes the SE370K the best tandem kayak on the market is the fact that once its deflated you can easily store it in a compact storage bag, which makes its transportation easy and less tedious. Its material is both saltwater and sun resistant. It comes with a self-bailing drain valve. It’s easy to haul since its lightweight. It inflates as well as deflates quickly in about 8 minutes. Not suitable during whitewater rapids and in extremely cold conditions. It’s hectic when transporting the kayak since it has only one strap. If you want a convertible kayak that can easily be used as a solo or tandem, then look no further, the Advanced Elements is what you need. And the conversion takes seconds to either use it as a single or double deck. The advanced Element comes in a sleek gray and either green or red design, which gives it a fine and a cool design. It has three seat locations that offer maximum support and comfort to riders as they convert it to a solo or tandem. It can hold up to two people and has a holding capacity of 550 pounds. So, if you’re with your buddy and wants to go fishing, then this kayak is what you need. It will comfortably hold both of you as well as all your fishing gear and other small essentials. The Advanced Element comes with customized deck configurations, which makes it last longer and thus adds to its durability. With this model, you don’t need to keep on repairing or replacing with a new one since it will serve you for a good number of years. 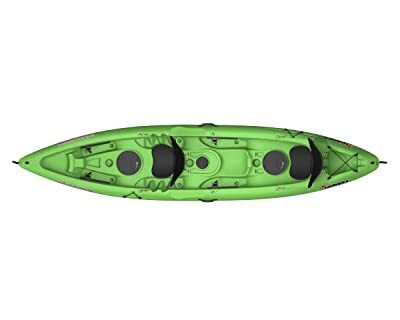 It’s a tandem kayak that is paddled even in rough waters since it comes with an extra-durable hull that makes it safe to ride in roughest bumps as well as scrapes on water. The hull is built with aluminum ribs that are sturdy, and three-layer construction adds to its durability, tracking, and overall boat performance. It comes with a duffel bag used for carrying the deflated kayak and thus makes its transportation easier. It also has a repair kit, and therefore it adds to its safety while on the water. It has customized deck configurations. It can hold up to two people with options to either use it as solo or tandem. It includes a repair kit for safety issues. 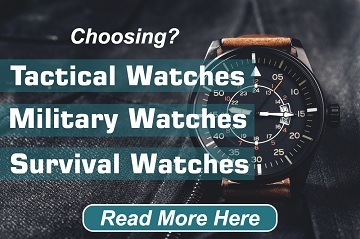 It lasts longer than other models since it’s made from durable materials. It’s very flexible and converts in a matter of seconds. It does not include any paddles. Its heavy, compared to other models. The Skipjack 120T is a versatile kayak designed for fishing, going solo kayaking, or with a companion as you explore the water bodies. It’s a boat that can be ridden in flat waters, lakes, and rivers since its well balanced and very durable. You don’t need to look any further since the Vibe 120T provides all the features you need in a tandem kayak. One thing to note is that it’s affordable as compared to other models with the same features. It has three seating positions that can hold two adults and one small child. It weighs about 72 pounds and can maintain a capacity of 500 pounds. For a two-person paddling, you can carry along with you all your fishing and camping gears, food, and other small essentials. The Skipjack 120T is easy to use since it has four carrying handles, which makes it less tedious to transport it out of the water. The storage system is also well designed in a bungee-tie-like design, and the storage hatchets give it a nice finishing touch. It’s a classy kayak with lots of great features. The Skipjack offers a sit-on-top feel that is easy to get in as well as get out of the tandem kayak. It’s built to last for many years because of its high-density Polyethylene material, and it has two aluminum paddles that are light but dependable. Some extra features include the two paddle plugs, eight scupper plugs, two-rod holders, and four carrying handles. If you want to have one of the best and affordable kayaks on the market today, then you need the Vibe Skipjack 120T. It’s very durable because of its high-density Polyethylene material. It’s spacious and offers adequate storage space for all your fishing gears. It’s a versatile kayak best used for fishing. It’s very stable on different water conditions. It comes only in two color variations. It does not provide any seat upgrade option. Reasons I Should Paddle with A Partner? Even though most tandem kayaks have options to be ridden solo, it’s always good to paddle with a partner. It can either be your buddy or your significant other. Here are some of the reasons. You’ll Work As A Team – Paddling can be hard as well as frustrating when paddling with a partner who does not communicate especially when turning. The only way to make paddling more comfortable, you and your partner must work as a team. The person in the back and the front must often communicate when turning to avoid chaos. However, you’ll need to practice before going into the water. It Improves Happiness Levels – It’s okay to paddle alone, but when with a partner, you can engage in talks as both of you enjoy the cool breeze from the water. It will reduce your stress and improve your happiness as you paddle or relax on the water. You’ll Be Thankful – After a long day of successful paddling together, both of you will be thankful to each other for working together in a manner that will enhance your relationship. Here is where families come together to achieve one goal, and that is paddling as one. You’ll Not Tire Easily – When you paddle with a partner, it’s a guarantee that you won’t tire easily on long trips. Both of you will work together to reach your destination as easy and fast as possible. You’ll Be Safe Most Times – Paddling alone can sometimes be unsafe when something happens like the boat tips over and getting back on the kayak can be tedious or become fatal. With a partner, you’re sure if anything dangerous and unexpected happens, both of you will work together to get out of that situation. How to Choose the Best Tandem Kayak? You should get a kayak that fits your body sizes, especially the legs. If you’re planning to go paddling with a partner, then make sure both of you are comfortable to go into the water with that tandem kayak. Also, the length and width determine the available space on the boat and the storage capacity for all your fishing gears, food, and other small essentials. When we talk of length and width, note that they significantly affect the speed as well as the stability of the boat. For instance, the shorter kayaks tend to be less stable and slower as compared to the longer ones. Choose a kayak that fits why you want to go kayaking. If it’s for racing, then go for longer boats that are super-fast. However, if you only want to relax on calm waters with your tandem kayak, then you can try the shorter ones. Always choose a tandem kayak that can support your body weight as well as the fishing gear on board. You don’t want the boat to tip over while on the water. If you plan to go paddling with a partner, then choose a stable and one that will comfortably hold and support both of your weights. You must be familiar with the type of tandem kayaks you want to have. Several types include recreational kayaks, modular kayaks, touring kayaks, inflatable kayaks, folding kayaks, fishing kayaks, whitewater kayaks, sit-in kayaks, and sit-on-top kayaks. Get a kayak that works best for you on how you intend to use it. Most tandem kayaks have the option of paddling but be sure with the advancements in technology there can never lack those that are automatic/motor engaged. Some paddled ones have the options to be upgraded with an electric trolling motor known as lifetime power mate. But if you want to enjoy paddling, then you need a padded tandem kayak that can hold at least three people. You need to get a tandem kayak that will serve you for many years. So, check the materials that make the boat, handles, paddle bars, and other physical elements on the kayak. 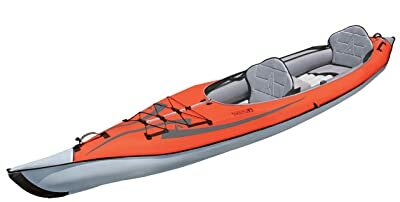 You can go for the PVC as well as plastic kayaks since they guarantee durability. To be on a safer side, buy a kayak that comes with some form of warranty in cases of faulty or damage that may require you to incur more money for repairs. Don’t buy a tandem kayak that will significantly affect your budget. It’s always good to budget before deciding on which kayak to buy. Check the features the boat has and see whether it’s worth the money you’re willing to let go to have that kayak. Purchase a kayak that does not sacrifice its quality and at the same time gives you maximum comfort while on the water. From the above information, now you don’t need to waste your time when looking for a tandem kayak anymore. Kayaking is fun, but sometimes it can be hectic to get an all-in-one tandem kayak that won’t let you down. On the review, they are eight best tandem kayaks that you can choose. You can read the descriptions, pros, and cons of each product and compare it with other kayaks on the list to see which model is of your choice. There will be no hassles anymore when it comes to purchasing a tandem kayak. Thanks for reading the article. Was it helpful? If so, don’t forget to share it widely and leave a comment below. Great article and nice selection of tandem kayaks. Thanks a lot for sharing!